Clinkz nimbly attacks with a barrage of arrows. Dramatically increases attack speed for a short time and grants Clinkz the ability to automatically dodge projectiles.It's hard to say whether the blur around the Bone Fletcher is from his flaming heart or his speed with the quiver. tips: Can dodge ranged attacks or spells. Imbues Clinkz's arrows with fire for extra damage.Clinkz simply lights his arrows from his flaming essence for quite the destructive effect. tips: Searing Arrows deal damage to structures. The damage is directly added to Clinkz' attack damage, as physical damage. 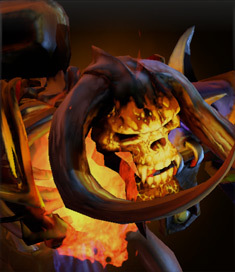 Clinkz moves invisibly through units until the moment he attacks or uses an ability.With a burst of fire and puff of smoke, the Bone Fletcher was nowhere to be seen. tips: Will not break most channeling of spells or items upon activation. Has a fadetime of 0.6 seconds. Clinkz summons an army of fiery ranged skeleton archers. Archers are immobile and die with 2 attacks from a hero. Skeletons use your current Searing Arrows ability and attack only heroes. Base damage is equal to your hero's base damage. Attack range is equal to your hero's attack range.